Forward - Have a friend whom you think will want to take up this job? Forward it to him/her here, and have the posting pushed onto his/hers screen. Report - There could be spamming Advertisements and Job Postings in the system which you might have detected. Do us a favour by reporting these spams to our cyber-guards.. Block - Do not wish to receive any further Job Posting from this particular company? Block them here. You can always Unblock them if you change your mind later by going to your Privacy Settings and remove the name from the Unblock List. 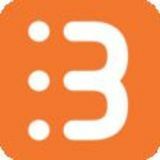 Delete - Do not want to see a particular Job Posting again? Delete it. 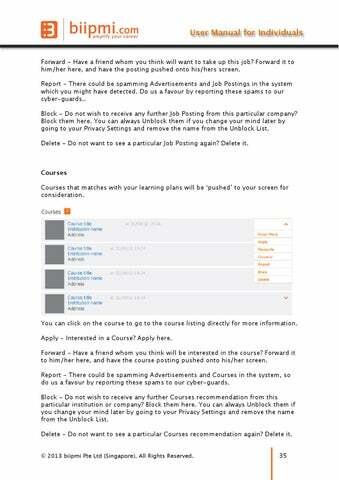 Courses Courses that matches with your learning plans will be ‘pushed’ to your screen for consideration. You can click on the course to go to the course listing directly for more information. Apply - Interested in a Course? Apply here. Forward - Have a friend whom you think will be interested in the course? Forward it to him/her here, and have the course posting pushed onto his/her screen. Report - There could be spamming Advertisements and Courses in the system, so do us a favour by reporting these spams to our cyber-guards. Block - Do not wish to receive any further Courses recommendation from this particular institution or company? Block them here. You can always Unblock them if you change your mind later by going to your Privacy Settings and remove the name from the Unblock List. Delete - Do not want to see a particular Courses recommendation again? Delete it. © 2013 biipmi Pte Ltd (Singapore). All Rights Reserved.